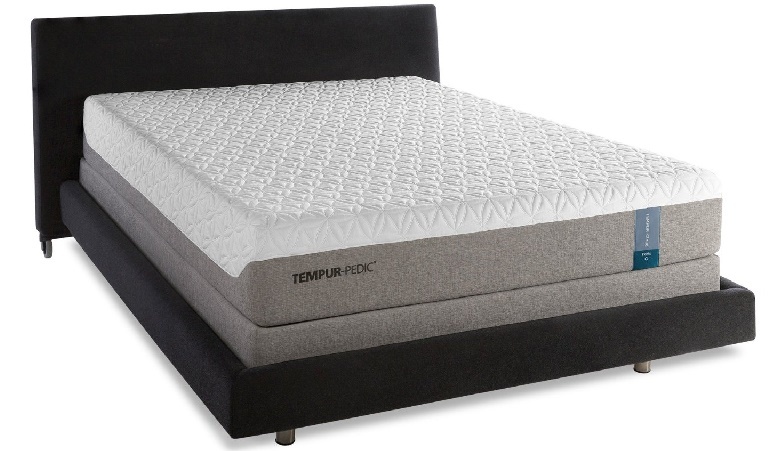 At its core, the comparison between Posturepedic and Tempurpedic mattresses is one between traditional innerspring mattresses versus the newer memory foam options. Posturepedic is one of the highest-rated innerspring brands on the market, and is known for both its firmness and comfort. On the other hand, the memory foam used by Tempurpedic has many advantages over innerspring construction, but comes with a much heftier price tag. Read on to explore some of the advantages and disadvantages of both brands in a comparison designed to help you choose the next perfect mattress for you. Comfort in a mattress can be rather subjective depending upon whether you are a pillow-top or ‘firm as a board’ type of person. If you prefer firmness, an innerspring mattress such as the Posturepedic may be for you. Pressure points caused by individual springs is the major drawback to this type of mattress, but Posturepedics tend to have more springs than other innerspring mattress brands, relieving any pressure points to provide a firm and even comfort. A few hybrid Posturepedic models also have a memory foam topper, for the best of both worlds. On the other hand, Tempurpedic mattresses are known for their memory foam which conforms to the body and has no pressure points at all. This is considered by the ‘soft as a cloud’ crowd to be the height of comfort. One drawback of the Tempurpedic mattress is a tendency to hold body heat, which can be a concern if you are one of those people who tend to run hot while sleeping. Luckily Tempurpedic has several cooling options which come with their various mattresses to combat this problem, and if you happen to be someone who is always cold this may actually be a bonus feature. Some Tempurpedic models also have interior air chambers to provide additional, and adjustable, firmness. Posturepedics are the longest lasting innerspring mattresses on the market, and have a projected lifespan of 6.3 years. As they are used there is also more likelihood that pressure points will develop, along with body indentations and sagging. Tempurpedic mattresses clearly win this category as they can last for 10 years or more with little concern. However even the best Tempurpedic bed will also begin to develop sagging and body impressions eventually, and if you have a model which has an air chamber there is always the danger of it possibly springing a leak. Memory foam beds, in general, are more expensive than innerspring mattresses, and this is also true when comparing Posturepedic and Tempurpedic mattresses. A mid-grade Tempurpedic mattress can easily cost $1,200 or more, and some of the higher end models can cost well over $5,000. Hands down, the Posturepedic mattress is the more affordable option, with the entry level mattress typically starting at price under $500, and the prices going up over $1,500 for the higher-end options.